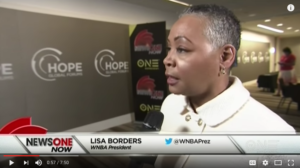 NEWSROOM | HOPE Global Forums | Presented by Operation HOPE, Inc.
Each year, financial literacy empowerment and economic education non-profit organization Operation HOPE hosts its Global Forums Annual Meeting. The purpose of these series of meetings is to help open up the discussion on how the positive effects of a free enterprise can be extended to everyone globally. 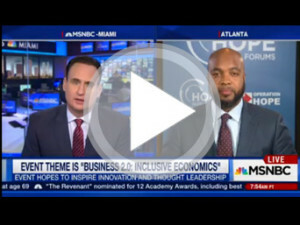 Atlanta Business Chronicle: You were recently in Atlanta to speak at the 2017 Hope Global Forum, which is a forum where the non-profit Operation Hope Inc. brought in industry, philanthropic and government leaders to outline a vision for the future of the modern global economy. How did it go and what did you speak about? Arianna Huffington: I love what the Hope Global Forum is doing by helping people through lifting them up. My theme was around the need for internal resilience and job skills. FICO is teaming up with Operation HOPE, Inc., a global financial dignity and economic empowerment nonprofit, to help consumers by providing FICO® Scores and other information that enables them to better understand their financial health. Jim Wehmann, executive vice president, Scores, at FICO is delivering a keynote address in Atlanta at the Hope Global Forum, April 11th, at 9:30 am ET. The new partnership extends FICO’s financial literacy and consumer empowerment initiatives, including FICO® Score Open Access for Credit and Financial Counselors. Global financial dignity nonprofit Operation HOPE, Inc. will host the HOPE Global Forums Annual Meeting in Atlanta, April 10-12, 2017 at the Atlanta Marriott Marquis. Now the largest gathering of global thought leaders and influencers focused exclusively on financial inclusion and the empowerment of the poor, the Forum will foster critical dialogue to help elevate underserved communities across the nation and around the world. 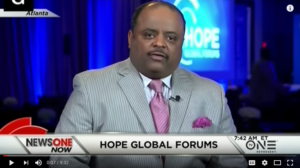 Last week’s Operation HOPE Global Forum in Atlanta was not what most people might envision as the lead-in to a long weekend dedicated to the memory of Dr. Martin Luther King Jr. Nevertheless, it was dedicated to one of the late civil rights leader’s most fundamental principles: economic equality for all Americans. 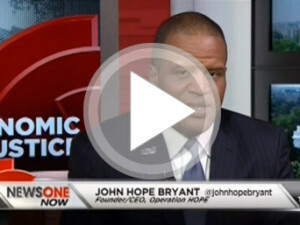 The fourth annual HOPE Global Forum in Atlanta was a testimonial to the economic revolution that Operation HOPE founder John Hope Bryant has been building since 1992. No, Operation HOPE’s revolution is not a sit-in or a protest march or an ultimatum to big business or Wall Street. Instead, it works with bankers, business leaders, social activists and civil rights leaders to implement strategies that will help those living below the poverty line as well as the working poor to access the American dream of financial opportunity. What’s in a name? In some cases, a whole lot. When the U.S. Treasury Department officially changed the name of the Treasury Annex building in Washington this week to honor the historic Freedman’s Bank, it underscored the importance of economic integration and financial inclusion to the nation’s economic well-being. ATLANTA, GA – October 8, 2015 – Today, Operation HOPE (HOPE), global financial dignity nonprofit, announced that the Secretary of the Treasury Jack Lew will provide keynote remarks at the HOPE Global Forum | Annual Meeting, January 13 – 15th in Atlanta, GA. Set against the backdrop of the Martin Luther King Holiday Weekend, Lew is taking this opportunity to provide a major policy address. The 2016 Annual Meeting will take place at the Marriot Marquis in downtown Atlanta, GA. and will serve as a call to action to inspire innovation and thought leadership around an inclusive global economy that works for all citizens. The event brings together heads of state, C-suite executives, civic and financial leaders to outline a vision for the future of the modern global economy. This vision includes all people as HOPE sees the poor, underserved and teetering middle class as untapped assets for economic growth, entrepreneurship and job creation. 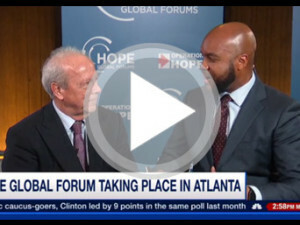 Atlanta – September 10, 2015 – Operation HOPE announced today that Robert E. Rubin, Co-Chairman of the Council on Foreign Relations and former Secretary of the Treasury during the Clinton Administration, will participate in a conversation at the 2016 HOPE Global Forums | Annual Meeting, January 13th – 15th. 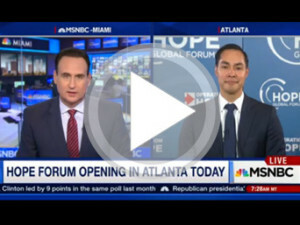 Against the backdrop of the Martin Luther King, Jr holiday weekend, in the birthplace of the civil rights movement, Operation HOPE will gather some 3,000 delegates to discuss and develop solutions for creating viable and sustainable solutions for a healthy economy, one inclusive of all our citizens. Long active in public affairs, Mr. Rubin joined the Clinton Administration in 1993 as first Director of the National Economic Council and served as our nation’s 70th Secretary of the Treasury from 1995 until 1999. (Read full bio.) Mr. Rubin is one of the founders of The Hamilton Project, an economic policy project housed at the Brookings Institution that offers a strategic vision and innovative policy proposals on how to create a growing economy that benefits more Americans. 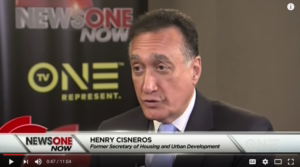 He is Chairman of the Board of the Local Initiatives Support Corporation (LISC), the nation’s leading community development support organization and serves as a member of the Boards of Trustees at the Mount Sinai Health System. Civil rights leader Andrew Young compared the rise of Atlanta with that of Detroit during a visit to the city. After working alongside the Reverend Martin Luther King, Jr., Young strove to stimulate economic growth in Georgia. He says his job might have been easier if Atlanta had had some of the features Detroit has. ATLANTA, July 15, 2015 – Leading financial dignity nonprofit Operation HOPE announced today that Dikembe Mutombo, eight-time NBA hall of Fame star and global humanitarian, will Chair a special session at the 2016 HOPE Global Forum | Annual Meeting in Atlanta, January 13 – 15.The three-day conference gather leaders and influencers from government, community and the private sector to outline a vision for the modern global economy. A vision where the poor, underserved and struggling middle class are viewed as untapped assets for economic growth, job creation and entrepreneurship. LOS ANGELES – July 9, 2015 – Operation HOPE announced today Los Angeles Civil Rights leader and Local Legend Rev. Cecil Murray and One West Bank CEO and President Joseph Otting will join HOPE Founder John Hope Bryant at the California African American Museum on July 16. 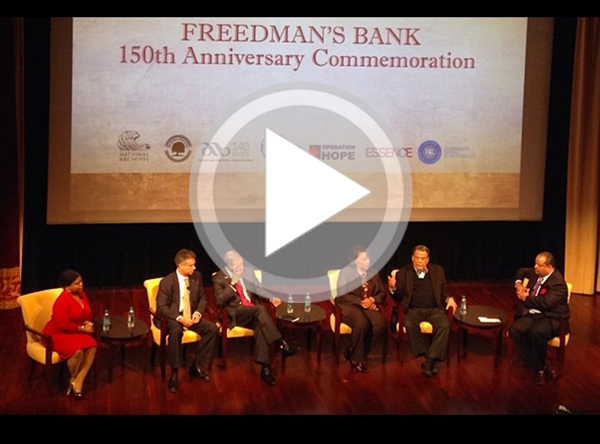 The event celebrates a forgotten and invaluable part of America’s history, the establishment of the Freedman’s Bank. Signed into law by President Abraham Lincoln, the Bank was established to spur economic development of formerly enslaved African-American communities. We are using the occasion to host a cutting-edge conversation exploring how the unfinished journey of the Bank can inspire Los Angeles to expand economic opportunity for all our citizens. The Los Angeles stop is part of a year-long, nationwide Tour using the history of the Bank as a catalyst to inspire communities to take control of their economic future. 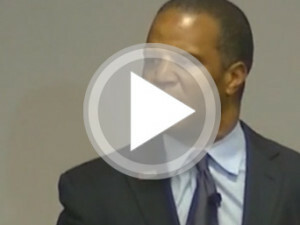 ATLANTA – June 30, 2015 – Against the backdrop of the Martin Luther King, Jr holiday, Operation HOPE will hold the 2016 HOPE Global Forums | Annual Meeting, on January 13 – 15, 2016 in Atlanta, GA, the financial dignity nonprofit announced today.Event co-chairs John Hope Bryant, HOPE founder, chairman, CEO and Ambassador Andrew Young, HOPE Global Spokesman, Civil Rights Icon and Chairman of the Andrew Young Foundation plan to host more than 3,000 global C-suite leaders from government, community and the private sector for three days of discussions, ideas and action. 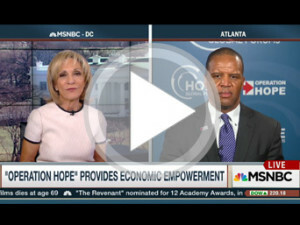 ATLANTA – June 25, 2015 – Financial dignity leader Operation HOPE announced today that Beth Ann Bovino, U.S. Chief Economist at Standard & Poor’s Ratings Services will be a featured guest speaker on the Main Stage at the 2016 HOPE Global Forum Annual Meeting in Atlanta, January 13 – 15, 2016. Set against the backdrop of the Martin Luther King, Jr. holiday, the annual meeting will be held at the Atlanta Marriott Marquis in downtown Atlanta, GA. The HOPE Forum is dedicated to curating an elite membership, committed to finding sustainable, transformational economies for underserved communities. 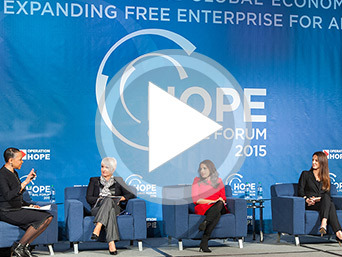 The 2016 HOPE Global Forum will bring together Heads of State, C-suite executives, civic and financial leaders to outline a vision for the future of the modern global economy. ATLANTA – April 15, 2015 – Operation HOPE announced today that it is the recipient of a $200,000 grant from The UPS Foundation, the charitable arm of UPS (NYSE:UPS), to bolster its financial disaster preparedness division, HOPE Coalition America, and support the 2016 HOPE Global Forum. 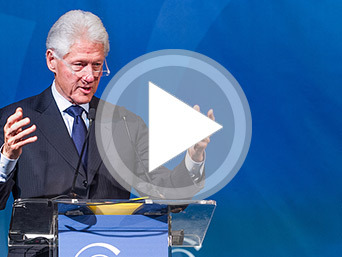 I’m still feeling inspired and warm after bearing witness to the amazing inclusive economics talk given by Former President Bill Clinton at the Hope Global Forum in Atlanta, GA. The purpose of the conference was to explore the why and how to expand free enterprise on the global level. These numbers panels, discussions and work sessions explored how empowering communities with access to technology, electricity and capital made them economically better as a whole. It is interesting that being a capitalist often means that you do not consider being conscious to communities or the negative externalities generated by the work that you do. For instance, if you can market a beverage to a community, why not market one that is better for health and well being while still seeking to enhance your profit margin? Going the more conscious route is actually possible. 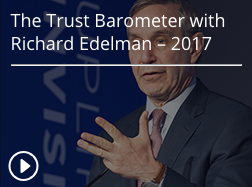 Catch the broadcast of a lively and substantive discussion on the history of the Freedman’s Bank and how it’s unfinished mission still resonates today. Conversation moderated by Roland Martin featuring Ambassador Andrew Young, Dr. Bernice A. King, Operation HOPE Chairman John Hope Bryant and other distinguished guests. The program will air on Sunday, March 22 at 8am ET and again the following weekend on Sunday, March 29 at 1:45pm ET. Visit Operation HOPE for additional news and information.